Talent for Tomathon Presents Musical Showcase! Talent For The Tomathon Present - Musical Showcase! At the age of 42 local man Tom Spencer was diagnosed with Progressive Supranuclear Palsy (PSP), a rare and progressive neurological condition caused by the premature loss of nerve cells in certain parts of the brain. In everyday language, this means that increasing numbers of brain cells become damaged leading to loss of balance, movement, vision, speech and even swallowing. "Tom can no longer be left on his own", said his wife Phillene "for fear of falling and this is a challenging time for us and our three children Anton, Monica and Tamsin." The link to their Crowdfunder appeal is https://www.crowdfunder.co.uk/the-tomathon. Family and friends of the Spencer family in Sutton Coldfield have rallied round to support Tom who simply want to find a way to help. They have launched a Crowdfunder appeal called The Tomathon with 313 supporters. A target of £30,000 has been set by 21st March 2019 at 2.51pm when they will be Running for Tom in Eton. An incredible £24,312 has been raised as on 2nd March to support Tom, his young family and to raise awareness of PSP. However, the main event for The Tomathon is the Reading Half Marathon on 17th March 2019 and there is also a group running the Hampton Court Half Marathon on the same day. "Our first contributor", said Phillene Spencer "was a runner in the Portsmouth Marathon on the 23rd December 2018". All runners pay their own expenses and entry fees. The Crowdfunder appeal works on 0% commission and all donations goes direct to Tom`s family for the care of Tom or if they so wish to be donated to a charity of their choice, such as the PSP Association. Family and friends of Tom are trying to adapt his home and hopefully keep Tom at home with his children a little longer. He is suffering from a rare terminal progressive illness. "We are hoping to support them as a group", said Emma Cockbill from Main Stage Drama in Sutton Coldfield "and personally in a wider context. We have a few events in mind: a classical concert for professional musicians and exceptional young talent from the area and open mic style event featuring young talent and more experienced performers". 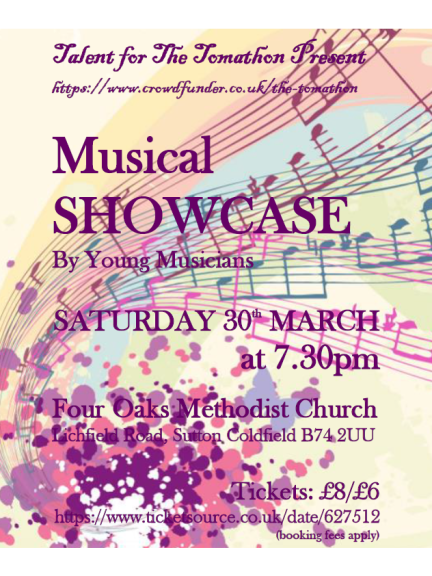 The first concert is called Talent for The Tomathon and takes place at Four Oaks Methodist Church, Lichfield Road, Sutton Coldfield on Saturday 16th March at 7.30pm. It is an evening recital by outstanding young musicians. "The standard will be stunning", said Emma Cockbill from Main Stage Drama "and it is all for Tom and his young family". Family and friends of the Spencer family in Sutton Coldfield would be grateful for your support. Tickets are £10 and can be obtained through https://www.ticketsource.co.uk/date/627505.